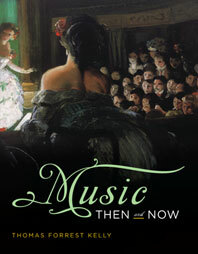 Music – Every music example in the book is available in each chapter’s Playlist section of this website. Also included are iLGs (Interactive Listening Guides). What to Listen For Video Lessons – In these videos, author Tom Kelly will help focus your attention on essential musical elements. Ebook – An identical copy of the printed text is available online, linked to all the media referenced within its pages. If you haven't Registered yet CLICK HERE. If you registered for the ebook, or purchased it online you don't need to register again.